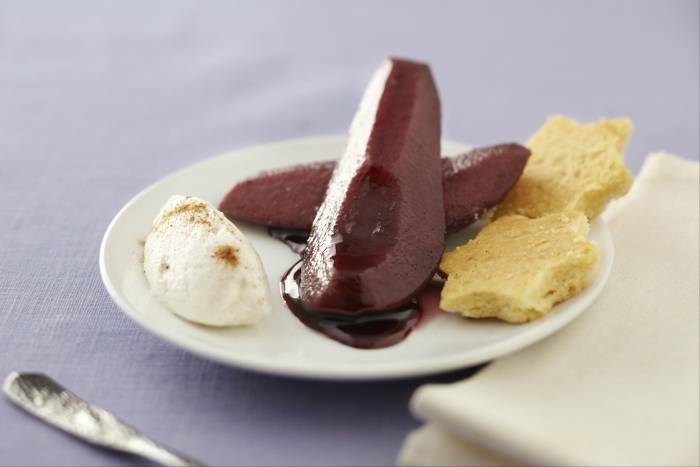 Delicious pears poached in red wine with a seasonal cinnamon cream and melt-in-the-mouth biscuits. Peel the pears, cut into quarters and remove the core. Bring the wine, water, sugar, spices and the zest of the orange to the boil and add the pears. Reduce the heat and simmer for 1 hour or until the pears are tender. Whisk the double cream, the icing sugar and the gound cinnamon together until the cream is stiff. Set aside in the fridge. Scrape out the seeds from the vanilla pod and add to the flour and icing sugar. Place all of the ingredients in a food processor and pulse until the mixture comes together in a ball. Roll out between 2 sheets of baking paper to about 5mm thick and the chill in the fridge for 30 minutes. Cut out rings to your desired size and bake in the oven for 15 minutes at 180 degrees until brown round the edges and firm in the centre. Dust with caster sugar whilst still hot and allow to cool on the baking tray. Serve the pears with the cinnamon cream and the biscuits.